The Turkish Foreign Ministry on July 27 denied there was a bargain between Turkish President Tayyip Erdoğan and U.S. President Donald Trump over the release of American pastor Andrew Brunson, under arrest in Turkey, and the release of a Turkish woman named Ebru Özkan, who was arrested in Israel, as reported by Reuters, citing Israeli official sources. There was actually a similar and more detailed story on the Washington Post on the same day. It reported that an unnamed aide of Trump said the U.S. president had called Israeli Prime Minister Binyamin Netanyahu for the release of Özkan, right after a NATO summit where the U.S. leader had a conversation with Erdoğan—during which Trump praised his Turkish counterpart in front of other NATO leaders and “fist-bumped” him. The Post story also mentioned a telephone conversation between Trump and Erdoğan, claimed to have taken place in the morning hours of July 26, which was not revealed by official sources, after a Turkish court decided to move Brunson from prison to house arrest and before U.S. Vice President Mike Pence and Trump made strong statements against Turkey. They threatened their NATO partner with “significant” and “large” sanctions if Brunson was not released immediately. It was Turkish Foreign Minister Mevlüt Çavuşoğlu who gave the first response on July 26, saying “no one dictates Turkey.” Then Presidential Spokesperson İbrahim Kalın chimed in, who, reminding NATO interests in common, said that threatening sanctions on them would not solve problems. Parliament Speaker Binali Yıldırım said the threats were in vain. There has been widespread reaction to the American leaders’ sanction threats against Turkey. Main opposition Republican People’s Party (CHP) leader Kemal Kılıçdaroğlu also slammed the U.S. move, but also criticized President Erdoğan and the Justice and Development Party (AK Parti) government of putting Turkey in such a position. But the reported bargain involving the releases of Brunson and Özkan between Trump and Erdoğan does not make much sense. Evangelical pastor Brunson has been indicted on charges of having links with the outlawed Kurdistan Workers’ Party (PKK) and the Fethullahist Terrorist Organization (FETÖ), who Ankara blames for the 2016 military coup attempt and whose leader, Fethullah Gülen, Ankara has been asking for the United States to extradite. “Give the priest, take the priest,” Erdoğan once told Trump indirectly, implying the extradition of Gülen. That is the level of importance Erdoğan gave to the arrest of Brunson. While on the other hand, the level of importance the U.S. Congress gave to the Brunson case is obvious from a recent arms embargo they are demanding from Trump, which includes excluding Turkey from the joint production of the new generation F-35 fighters. The demand also comes from fury over Turkey’s decision to purchase the Russian S-400 missiles. Pence has pinned the tweet, in which he threatened significant sanctions against Turkey if Brunson is not released immediately, on his Twitter account. All these are taking place against the backdrop of Turkey being asked to contribute, and agreed to contribute more, in the last NATO summit against threats “from the east and south,” meaning Russia and the Middle East. Özkan, on the other hand, was arrested by Israeli security forces for allegedly smuggling money and perfumes to Gaza for Hamas. The accusations are rather minor when compared with those against Brunson. And it is not politically comparable. It simply doesn’t add up; it doesn’t fit into the bigger picture. It is not likely and logical that Erdoğan would raise or agree to a proposal comparing the release of Brunson with that of Özkan. Anyone who knows Erdoğan would agree with that. And without even taking into account both Trump and Erdoğan’s views on the independence of courts in their respective countries. The level of exaggerated reaction shown by Trump and Pence to Erdoğan at a time when the Turkish leader is in South Africa for a BRICS meeting — to which he was invited by Russian President Vladimir Putin and where he’s on the verge of sealing a major economic deal with China — might indicate something more than sincere humane worries about Brunson. That is why the current claim doesn’t make much sense. 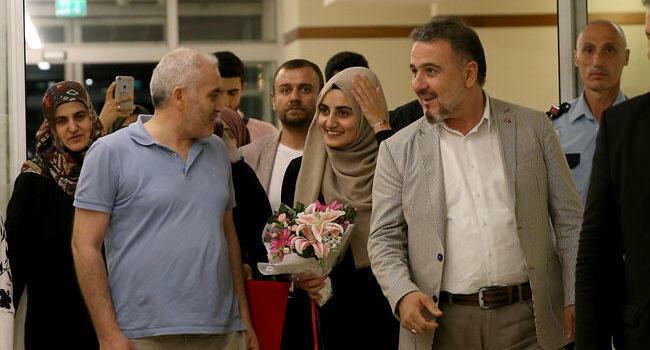 If there was a bargain, it would be on something much bigger and much more strategic, not on the release of a Turkish citizen charged on minor accusations. Having said that, the current bottleneck Turkish-American relations are at should be avoided from turning into a deep crisis. It would neither be beneficial for Turkey nor the U.S.; it would make other parties happy.